This Saturday, May 10th, is the 22nd anniversary of the Stamp Out Hunger food drive! Stamp Out Hunger is a project by the National Association of Letter Carriers looking to serve those in our communities who are hungry. 1. This Saturday, place a plastic bag of non-perishable food items next to your mailbox. 2. 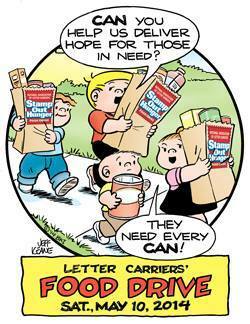 Your postal carrier will pick up the bag and it will be delivered to a local food bank or charity in your community. You may receive a designated bag for the food drive in your mail prior to Saturday, but if not, it’s okay! Simply use a regular plastic grocery bag to hold your food items. Plus, if you’ve got a nice stockpile from couponing, it’ll be super easy to fill your bag and help others! For more information on this food drive, head to Stamp Out Hunger’s facebook page.